Last year, a million young school children’s education was disrupted and about 2,800 pre-school classrooms were destroyed due to the typhoons Ondoy and Pepeng. 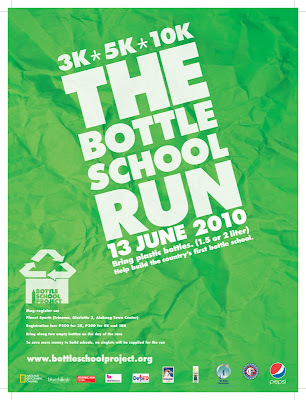 This year, through the pioneering efforts and innovative solutions of MyShelter Foundation spearheaded by the country’s noted social entrepreneur Illac Diaz, in partnership with the Department of Education, City of Taguig, Pepsi, Insular Life and Cecon, a one-of-kind run-for-a-cause dubbed as The Bottle School Run will be staged at Bonifacio Global City on June 13, 2010. All proceeds of this noteworthy race will be used to replace and rebuild a damaged school in Taguig using a ground-breaking architectural model – school classrooms mainly made of soda PET bottles. 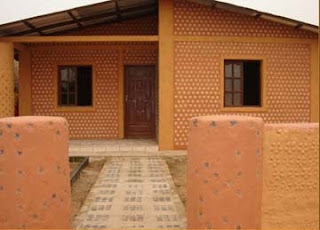 Now, runners of all persuasions are invited to actively take part in a unique racing event to create a community-based, people-empowered solution which starts with building ecologically-sound and architecturally-revolutionary classrooms for children aspiring to pursue a path of literacy and knowledge. 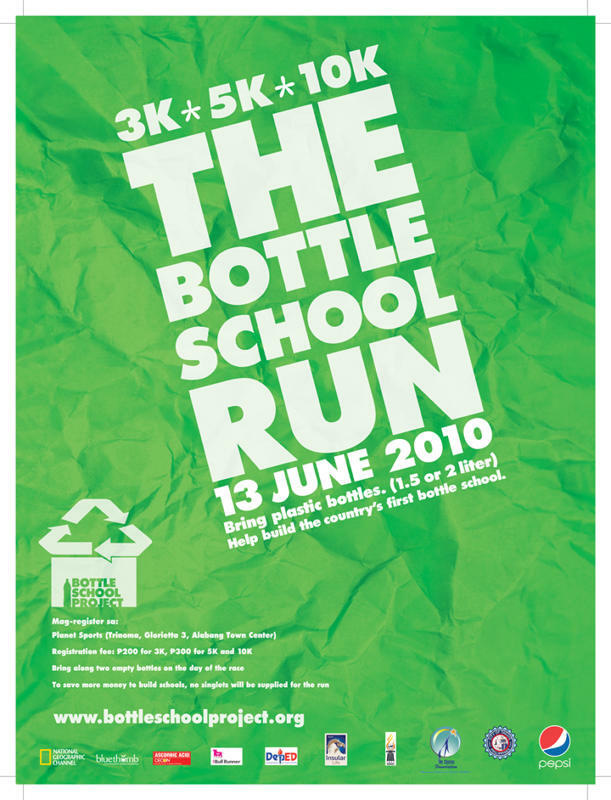 The Bottle School Run is a distinctive race for seasoned and beginner runners, alike, as it provides them an opportunity to become advocate runners who could champion an honest cause, a solution that can change the world. It sets a symbolic backdrop where the chase of each participant runners for individual personal record enables beneficiary children chase their dream of obtaining education. Distance categories are 3k, 5k, and 10k. Registration fees are P200 for 3k, and P300 for 5k and 10k. All participating runners are requested to bring two bottles with a 1.5 or 2 liter size of any soda brand on race day. Gunstart times are 5:30am (10k), 5:45am (5k), and 6:00am (3k). For further race details, please visit www.bottleschoolproject.org. 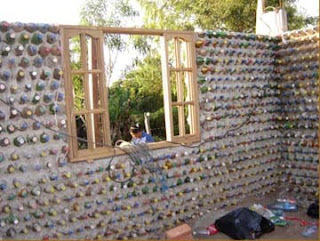 Inquiries may be directed to thebottleschoolrun@gmail.com or to Liza Fumar, Co-lead, The Bottle School Run, through +63 927 -2845436. Alternatively, interested parties may contact Edward Kho, Race Director, through +63 915-9990187.